The Rabin Cone Test is a revolutionary new color vision test, and is the sole Color Vision Test for the US Air Force. With 15 years of US Air Force research, the test is sensitive enough to detect severity of cone deficiency as well congenital color deficiencies. The Rabin Cone Test can be used to detect and monitor acquired color deficiency caused by AMD, Glaucoma, Diabetic Retinopathy, MS, Parkinson’s Disease, TBI Retinal Toxicity due to High Risks meds such as Plaquenil. Identification of patients at-risk for developing disease. Earlier recognition and intervention of disease. Rapid detection of disease progression. The sensitivity and specificity is comparable to anomaloscope testing and exceeds PIP sensitivity in practiced observers. 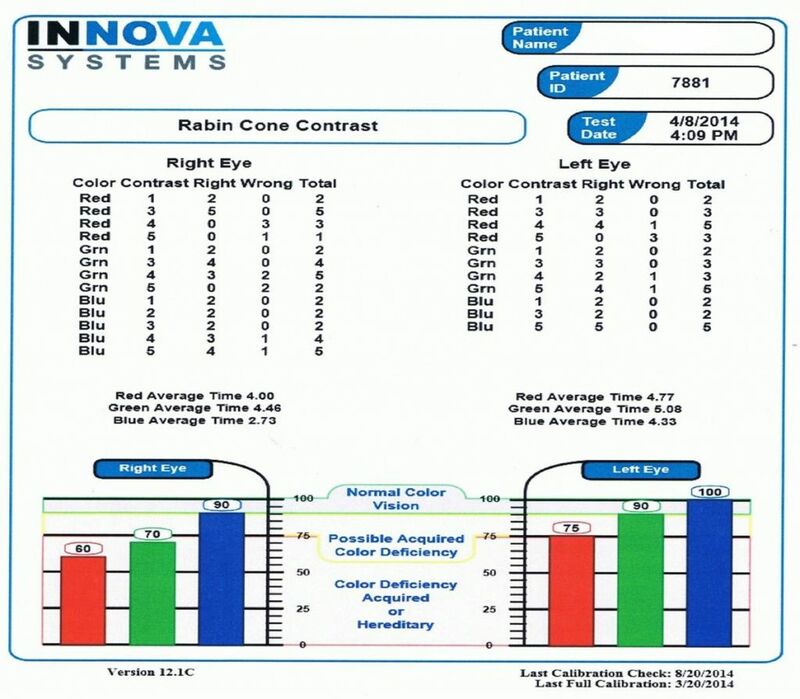 The Rabin Cone Test provides a rapid, clinically expedient, measure of color vision for quantifying normal color performance, diagnosing type and severity of hereditary deficiency, and detection of acquired sensitivity loss due to ocular, neurologic, and/or systemic disease, as well as injury and physiological stressors, such as altitude and fatigue. Since 1999 The Color Correction System™ has a 100% success rate with all patients being able to pass the Ishihara Color Plate Test. Treatment also available for Quantitative Color Blind Tests or Arrangement Tests such as the Farnsworth D-15, Lanthony desaturated D-15, and the Farnsworth-Munsell 100 hue test. The ColorCorrection System uses an advanced combination of unique tests and filters to determine the exact wavelength of light to design customized ColorCorrective lenses. This treatment has helped people enhance their lives and careers – electricians, law enforcement officers, firefighters, military personnel, graphic artists, boat captains, and railroad engineers. Dr. Azman’s color vision treatment has been enhancing lives across the globe!